"A favorite relic/manufactured relic card." This was an easy one, the awesome Joe DiMaggio bat card sent to me by Corky from Pack War last year. This elevator call box on West 28th street has the phone number EX2-6400. EX stood for Exeter which was a Queens exchange. 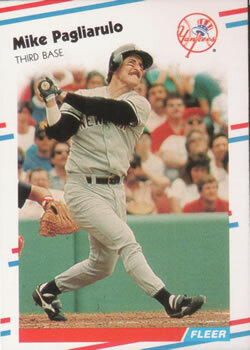 "A favorite oddball card from the 1990s or later." 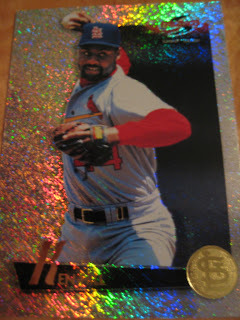 No one ever talks about them, but Denny's put out some very high-end looking, holographic/shiny cards for several years in the 1990s. Some of the best looking cards of the era. Went to the Yankee game today and saw a very entertaining game. The big highlight of course was Aaron Judge's grand slam that gave the Yankees a 5-2 lead. There was some back-and-forth between the Yankees and A's after that but the Yankees never relinquished the lead - the final score was 9-5. There were some aggressive, exciting plays by the Yankees on both offense and defense, and some lucky breaks as Oakland was very sloppy on defense. Overall a fun day at the ballpark. And some other vintage signs outside of NYC's Trailer Park Lounge. I had done this last year but got a better one this time. I really like the Bond Bread sign, the old soda sign, and even the vintage door pushes. 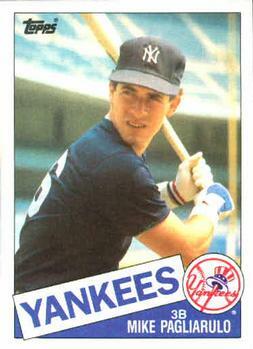 "A favorite oddball card from the 1980s." Of course I had to go with the fantastic Spokane Indians mall baseball cards. I picked 1988 because I like that year's design the best. This was a bit of a lucky find. I was walking past a deli on 33rd street that was getting its outer wall paneling replaced. I happened to be walking by at just the right time to see this old sign, briefly visible before it was covered up again. I didn't know what the picture was and ended up having to do quite a bit of research to figure out what it was. Turns out is an old logo - 1970s or 1980s - for a still existing company now called Broaster Foods (the logo here stays Broasted Foods). The company, which uses a unique method of frying chicken, now has an all-red logo instead of the very-70s yellow, brown and orange shown here. At some point 30 or 40 years ago a previous eatery at this spot would have sold this kind of chicken. "A favorite oddball card from the 1970s." Here's a cool Jerry Reuss 1977 Pepsi-Cola disk. This came from a Tribecards giveaway, which I guess explains why all the players in the promotion on the back are from Ohio teams. I wonder how many people ordered those "to my buddy" T-shirts. Walking down 38th street I was surprised to see what was apparently an authentic World's Fair sign from 1964 in a doorway. The doorway leads to Hecht Sewing Machine and Motor, a 100-year old Garment District institution. The owner is an antiques collector, and addition to the Worlds Fair sign many more antiques can be seen in the store's window. "A favorite oddball card from the 1960s." I don't own many 1960s oddballs, just these three 1968 Topps game cards. I couldn't pick a favorite so here is the complete 1-2-3 inning. Here is something that is not unique to New York, and you can look for where you live. Bell Telephone used to put bell-shaped metal tags on every telephone pole in the country. While most are long gone you can still find many of them on telephone poles all over the US. This one in Levittown has NYT stamped on it, for New York Telephone. 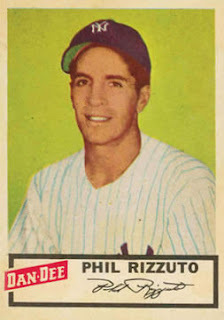 "A favorite oddball card from the 1950s." I don't have any 1950s oddballs, and don't really know much about the cards from that time period. I looked around the Trading Card Database for a while and found this nice looking set from Dan Dee Potato Chips. Dan Dee was a pretzel and potato chip company in Ohio, West Virginia, Pennsylvania and New York from the 1910s to the 1980s. Two US presidents were born in New York City. The first was Theodore Roosevelt, who was born at 28 E. 20th Street in 1858. The house was torn down in 1916 but upon Roosevelt's death in 1919 it was rebuilt and remains today as a museum. Donald Trump was born at Jamaica Hospital, just north of the LIRR tracks, in 1946. You may be able to see the words "Trump Pavilion" on the closest hospital building. It is named after Mary Trump, the President's mother, who made a large charitable contribution to the hospital in 1975. "A card of a common player that always seemed to elude you." The first set I ever collected was 1987 Topps; both 1987 and 1988 Topps were the cards I had by far the most of when I was a kid. Later as an adult they were the first two sets I completed, in 2007. Gary Gaetti was one of the last cards I need for both sets. 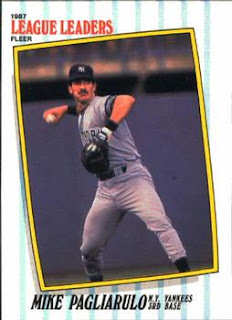 I was probably 775 cards into both of them before I got Gaetti for either one. "A card of a rookie you thought you were 'investing' in." I never really collected cards thinking I would sell them, so this doesn't particularly apply to me. However, as a kid I did keep some of my better duplicate cards in plastic, thinking I might sell them or trade for something good, so I should keep them in good condition. I don't remember all of the cards (none of them were particularly good by modern standards) - pretty sure one was the Juan Gonzalez Topps rookie. Here's another Bell Telephone sign still visible in New York. Architect Ralph Walker is considered the "father of the modern telephone building" and designed several telephone buildings in New York, including one he called the Stella Tower after his wife. Though it was converted to luxury apartments many years ago, there is still a Bell Telephone sign on a back entrance. "Your favorite parallel card based on the parallel, not the player." I definitely have to go with the sparkly Summit variations - they look absolutely beautiful in person, probably the most sparkly cards I've seen. Al had a guy looking for some Griffeys, so he asked me for one of every Griffey I had. That came out to 26 cards, so I traded them for 26 cards out of his binder. It can be hard to tell if I have a card or not, so I went with mostly parallels as they were more likely cards that I needed. No Yankees in the binder, but I like the Cardinals so I certainly gravitated to this refractor. Two different gold parallels from 2008 Topps. One has gold lettering, the other a gold border. I had a feeling normal 1998 Upper Deck cards didn't have gold lettering and i was right - it's from a parallel set called "Special F/X" which was new to me. The other variation is the foil background. "A favorite card from a country other than the United States." A few years ago I interviewed former major leaguer Bobby Scales, and he kindly sent me an autographed card of his from Japan. That was a really nice thing for him to do and it is one of my favorite cards in my collection. The old Bell Telephone signs from the 1920s and 1930s are highly collectible now, and it is extremely rare to find any still in place. 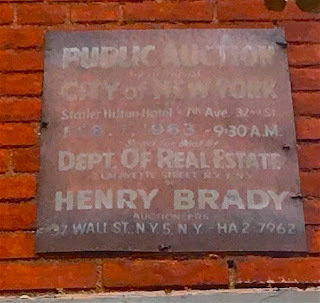 However this great specimen remains in Greenwich Village; like the real estate auction sign, being the same color as the wall has helped it blend in and miss getting taken down for all of these years. "A card of a player who became manager of your favorite team." I have been following the Yankees for 30 years. They have had seven managers over the first ten of those years and two in the last twenty. Joe Girardi was a key members of the 1996 World Series team, the first championship I saw, and has been a very solid manager for the Yankees, consistently getting teams to overachieve, despite not having nearly the talent that Joe Torre did. This year may be his best managerial job yet, if he can sustain the Yankees' surprisingly successful start. This is one of the coolest things I've photographed with the wallet card. It is a metal sign advertising a 1963 real estate auction that is still attached to the wall of a Greenwich Village apartment building. It is a red metal sign that apparently has not moved even though the auction occurred 52 years ago. I guess the red sign blended with the red brick and nobody noticed it when it was time to take it down. Feb. 7, 1963 - 9:30 A.M.
2 Lafayette Street N.Y. 9, N.Y.
"A card from the first set you put together hand collated." The first set I completed was the first set I collected, though it took me twenty years. 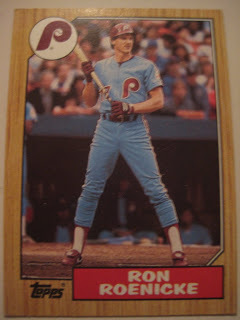 This Ron Roenicke card was the last one I needed to finish the set. This set is still one of my favorites and the photography here, simple but eye-catching, is typical of the set. Klube's Restaurant opened around 1900 on 23rd Street and Third Avenue, part of a hotel called the St. Blaise (which was actually a brothel). Eventually the hotel faded away but the restaurant stayed on until 1965. Despite being out of business for over 50 years, the Klube's sign has remained in place as other bars and restaurants occupy the space (currently known as The Globe). "A card of a player whom you appreciate but don’t like." This was a hard one to figure out initially. Usually if I don't like a player I don't appreciate them either. Then I thought about teams I don't like and it became easier. As a Yankee fan I certainly dislike the Mets. As a result I was always inclined to dislike Mike Piazza. (I never really had an opinion about him when he was with LA.) He always seemed whiny and annoying. 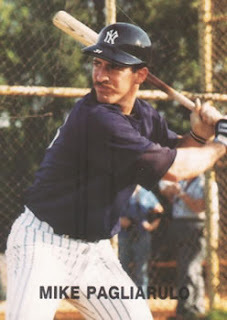 Still, in regular season Subway Series and the World Series, he was definitely the one Met you hoped didn't come up to bat in a big situation, because he was such a dangerous hitter. I may not appreciate Mike Piazza, but I sure do like this card! Yesterday it was some Jeters and Mattinglys. He asks for those a lot and I'm getting pretty closed to tapped out on those two. Some cards that aren't shiny, but I still like . . .
. . . and some that are shiny. I didn't realize the Soriano was a refractor until I took the photo. Nice surprise! Al the street vendor wanted some Matsuis and Posadas. I gave him a few and he had a new binder that I picked some cards from. Some Topps oddballs: Stars, Chrome, 1st Edition and sparkly gold parallel . . .
. . . and three refractors. "One of your favorite cards from the 2010s." Like the 2000s, there is not too much variety or individuality in modern card photography. But kudos to the most recent iteration of Stadium Club pulling out some great, rarely seen photos from the past. 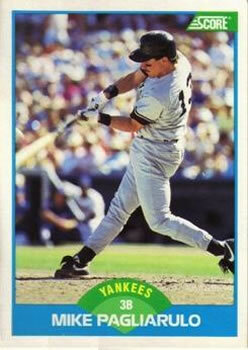 Here is Pags’s Topps rookie card. 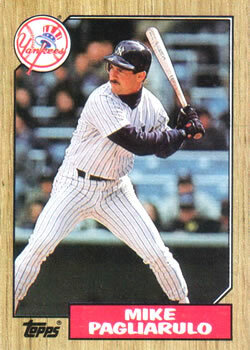 It’s weird seeing him without his mustache so this will be the only pre-1987 card shown here. 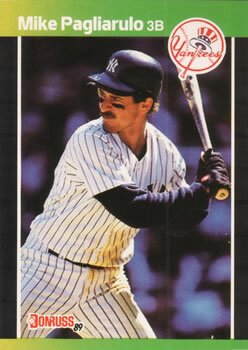 The pinstriped design here looks great on a Yankee card. Always glad to throw in a Sportflics card. 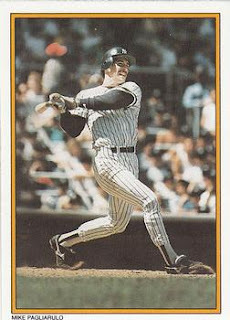 This was an unlicensed 7-card set I got around 1987 or 1988, I think in a blister pack of random Yankee cards I got in a stationary store. Good-looking card on that era’s classic baseball card design. 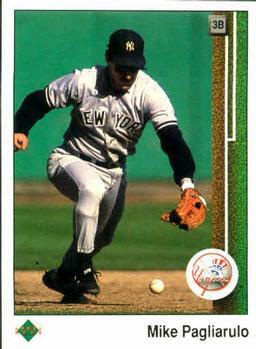 These cards were a big deal at the time – nice to see Pagliarulo get one. The red-white-and-blue design is one of my favorites from this era. Looks like a home run swing at Fenway Park. I’m not much of a Donruss fan. This is probably my favorite Donruss design of the era, due to the colorful borders. 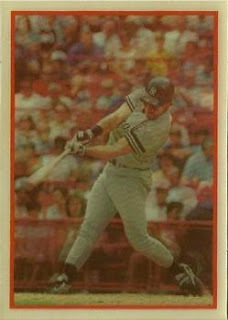 Overshadowed by Upper Deck, Score had some pretty good photography back in the late 1980s. Upper Deck was coming up with shots that hadn’t been seen on cards before. Nice shot of Pagliarulo charging a ground ball, although his face is covered in shadow. "One of your favorite cards from the 2000s." There has not been nearly the kind of fun and quirkiness in 21st-century baseball cards as there was in the 20th. I couldn't think of a stand-out card for this decade so instead I chose a card commemorating my favorite baseball memory of the 2000s, the Yankees' Subway Series victory over the Mets.